This kit is a brand new mod for the MT-2. I have built it from scratch around the Quad-Gain switch assembly and the two new opamps! I have taken the pedal and flattened the EQ. That's right, the original box of bees has been transformed into an awesome dirt box. The MT-2 has two gain stages with a ton of gain. By replacing two of the opamps I've reduced noise and added clarity. The two switches now offer 4 gain modes! That's right, FOUR! A ton of tonal territory is now available, from singing Johnsonish type violin leeds to edgy crunch and all points in between. With this Kit you will receive a 3mm Super Bright Clear White LED, Solder and Desoldering Braid along with detailed easy-to-follow High Rez PDF Mod Instructions sent to you as an e-mail attachment. This kit is exactly the same as my regular MT-2 Sustainia Mod but with a switch. The switch will offer 3 gains. One side will engage the 1N34A diodes and one side the LEDs. The middle will bypass the diodes altogether which will give you a very overdrive type gain structure with the gain turned down. This toggle switch makes the Sustainia a very versatile pedal. One that will cover the heavier stuff for the metal heads and the bluesier stuff for rock and blues players. You will not believe the smooth thick gain the LEDs give you. This is a solo players dream mod! MT-2 Sustainia Tri-Gain Plus Sound Samples - This mp3 was graciously recorded and sent to me by Sasha Brusin. Sasha recorded it using an MT-2 modded with my new Sustainia Tri-Gain Plus Mod with a Chip Adapter and a OPA2134PA Burr Brown Chip. The clip was recorded directly into Guitar Rig, set for a CLEAN Plexi emulation. Delay was added for ambience, nothing else. Man, can this cat play! Thank You Sasha! MT-2 Sustainia Tri-Gain Sound Samples - This mp3 was graciously recorded and sent to me by Jo Ellis. Joe recorded it using an MT-2 modded with my Sustainia Tri-Gain Mod. Here's how Joe recorded it..... Both were done in (LED clipping mode) in front of my NMV Marshall JMP Super Bass half-stack. The guitar used is a custom built Les Paul loaded with Seymour Duncan Seth Lover humbuckers. Because the amp stays clean even with the volume pretty high up (volume for the recording was between 5-6), I used the pedal for some boost and the pedal's distortion at about 10:00. Thanx Joe for the great tones and for sharing you music with us! - Monte Allums! Mark Burkert. Mark is playing a Suhr guitar and solos at 3:18 in the video. Mark is also using a GE-7 modded with one of my kits that he uses to boost his solos. Thank you Mark for sharing your music with us. With this Kit you will receive a 3mm Super Bright Clear Blue LED, Solder and Desoldering Braid along with detailed easy-to-follow High Rez PDF Mod Instructions sent to you as an e-mail attachment. With this Kit you will receive a 3mm Super Bright Clear Blus LED, Solder and Desoldering Braid along with detailed easy-to-follow High Rez PDF Mod Instructions sent to you as an e-mail attachment. This is my second Mod for the MT-2. I've gotten a lot of requests asking if there are any mods that will clean up the pedal when the gain is turned down and also reduce noise. My MT-2 Sustainia Mod has accomplished both of these requests. I have also flattened out the EQ and enhanced sustain. Now with the tone controls at 12 O'clock the EQ is almost totally flat with a mild fattening of the signal. The gain will now go from clean boost to crunchy overdrive to a take-no-prisoners distortion with sustain for days. You will not believe the sustain this mod will give you! But, for those that prefer more gain with no clean boost I include instructions and two 1N34A Germanium Diodes that will give you that, along with a much smoother gain structure and enhanced sustain. So, depending on your particular tonal needs, this mod will cover both areas and it does both very well. My MT-2 Sustainiac Mod completely transforms a very harsh nasally pedal into one of the sweetest tastiest overdrive/distortion pedals available at any price. This is, without a doubt, the best mod for a MT-2 that's available anywhere at any price! MT2 Sustainia.mp3  MT-2 Sustainia Sound Samples - Played entirely through a Boss MT-2 modded with our Sustainiac Mod Kit. Played on A Strat through a stock Fender Hot Rod Deluxe amp mic'd with a SM57. The Uni-Vibe type Chorus effect is a Yamaha MagicStomp II. I also used our new CS-3 Opto Compressor on this mp3. This is one FAT and Transparent Compressor after the mod. Absolutely smokes any compressor at any price. heavy_metal.mp3  MT-2 Sustainia Tri-Gain Heavy Metal Sound Samples - Ibanez S520EX w/ EMG 81X Bridge pickup -> MT-2 Sustania -> Peavey ValveKing 112 Combo Clean Channel w/Eminence Man-O-War -> SM57. A little bit of the amp's built in reverb was used. That's it. If you're into metal this mod is right up your alley! With this Kit you will receive Solder and Desoldering Braid along with detailed easy-to-follow High Rez PDF Mod Instructions sent to you as an e-mail attachment. 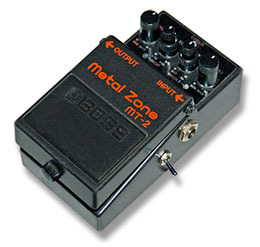 Works With Both Regular MT-2 & Sustainia MT-2 Mods! 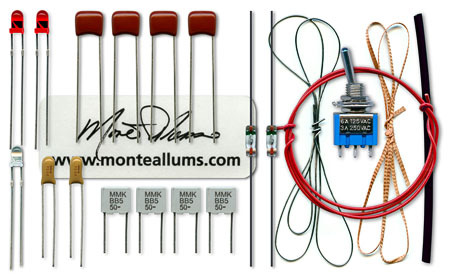 - MT-2 Tri-Gain Upgrade Kit - This kit allows users of my regular MT-2 and MT-2 Sustainia Mod Kits to upgrade to a Tri-Gain Clipping Circuit. Notice: This Tri-Gain Upgrade kit may be used to replace any diode in any pedals clipping Circuit. This kit adds a ton of tonal options to both my regular MT-2 and MT-2 Sustainia Mods. 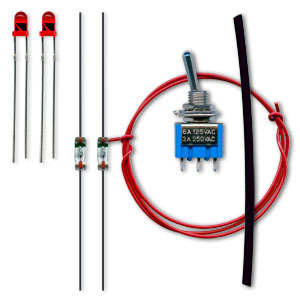 With this Kit you will receive two 1N34A Germanium Diodes, two 3mm Red LEDs, one Toggle Switch, 24 Ga. Wire with Heat Shrink Tubing & Two 3mm Red LEDs. Very easy to follow illustrated instructions are sent VIA e-mail attachment along with paper instructions sent with the parts. 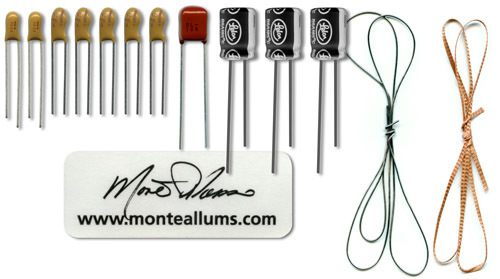 Electrolytic caps in tube amps, over a period of time, start to leak, loose their tolerance and go bad. It’s just the nature of Electrolytic caps. Sometimes the leaking is actually visible. But Electrolytic caps can look okay and still be faulty. By replacing Electrolytic caps in older pedals you can actually improve the overall effect of that pedal. Honestly I was skeptical until I received an email from a client that was having issues after he modded his Boss BF-2 with one of my kits. He said the flange effect was barely noticeable. A couple of weeks later I received another email from the same client. The client said he had solved the issue by replacing all the Electrolytic caps in his BF-2. This peaked my interest so I started experimenting. I was astonished how some of my older pedals benefited from the cap upgrade! Noise seemed to be reduced and clarity and presence of the effect were enhanced. I am now offering these Cap Upgrade Kits for many of the pedals I offer kits for. In some cases some of these caps are already upgraded in the kits that I offer. 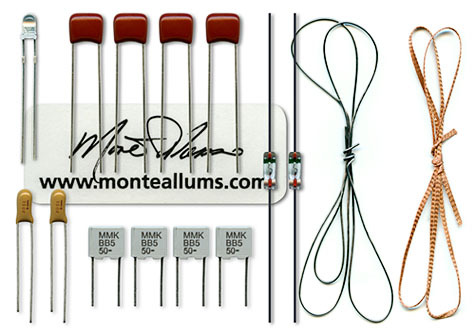 But I am offering kits that replace all the Electrolytic caps for those that have not purchased my kits. They will benefit from upgrading the Electrolytic caps that I do not replace in my kits. You’ll find that some of these same caps are already replaced in the kits I offer. It’s a win win all around for those that want the maximum benefit when upgrading their pedals. But I didn’t stop there, when possible I have upgraded these Electrolytics with Metal Film and Tantalum. Not only do these caps have tighter tolerances but they will also last the life of the pedal.